The Pontiac V-8 block is constructed of cast iron, and though its displacement increased from 287 to 455 ci by enlarging bore and lengthening stroke over the years, the external dimensions didn’t waiver far from the original design. A number of changes occurred during the course of its production run, however, and some limit component interchange. Included among them are revised engine mounting points, transmission bell-housing bolt pattern, starter location, main bearing diameter, and cooling system differences. The basic block features a relatively tall deck height of 10.24 inches, which is measured from the crankshaft centerline to the deck. The deck surface is very thick and rigid. Cylinder head bolt holes are drilled and tapped through the deck surface and into individual bosses within the water jacket walls. Unlike many other makes, Pontiac V-8 bolt holes do not extend into the water jacket, so no thread sealer is required during installation. 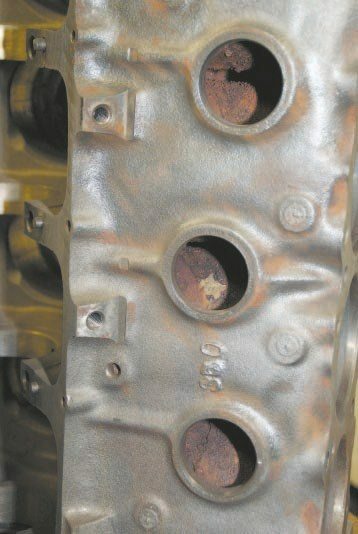 The block casting number contains several digits and, depending on the year, is sometimes found on the passenger’s side of the block or at the rear of the block on a ledge near the number-8 cylinder. This 9790079 block is a 1968–1969 350 casting. Depending upon the application, Pontiac sometimes ground off several or all of these numbers and stamped others into place. The block’s casting date is generally located on the distributor pad, and “L186” found on this unit translates to December 18, 1966 (L = Dec, 18 = 18th day, 6 = last digit of 1966). The block casting number is also found in this area on most 1964–1967 castings. The visible digits in this example are what remain of the original “9786133” after machining. It indicates that this block is a 1967 400. The symmetric 90-degree design features large main bearing saddles, which adds overall rigidity and allows for using long connecting rods for good rod-to-stroke ratio. The main bearing caps are fastened to the block by two large bolts in most cases and by four bolts in certain highperformance applications. In either instance, the main caps are located by dowel pins, which are intended to prevent the caps from wandering during high-speed operation. When searching for a block to use in a project, one from the model year of the vehicle is ideal since the engine and transmission mounts should correspond with those of the chassis. If that’s of no real concern, then any 1965 to 1979 block generally makes a suitable choice since these engines are the most supported by OE and aftermarket parts suppliers. The engine mounts may be different for certain years, but most engine builders and restoration parts supplier offer specific adapter kits for such situations. Pontiac blocks featured two freeze plugs per side through 1966. Another was added in 1967, bringing the total to three. This is a quick and easy way to narrow down the vintage of a particular block when hunting for possible options at salvage yards or swap meets. The Pontiac V-8 uses a bolt-on oil filter adapter, and the type most hobbyists are familiar with comes in two distinct versions. One places the filter at about a 70-degree angle from the block (left) while the other places the filter at a 90- degree angle. The original application depends upon the type used to assemble a particular Pontiac. The 75-degree unit seems most common and tends to provide the best exhaust system and chassis clearance. To identify the block, the 2-digit engine code, “XU” in this instance, denotes original application. It is located on the front of the block, just below deck surface of the passenger side. The six- or sevendigit numeric stamp just above it is the engine serial number (ESN), which is the engine’s sequential build number. It does not directly correlate to the vehicle identification number (VIN) of the vehicle in which it was originally installed. The motor mounts were moved to the side of the block in 1959, where they remained throughout the duration of Pontiac V-8 production. Some blocks contain two, three, or five motor-mount bosses depending upon the year and chassis application. In some instances they are not drilled and tapped. 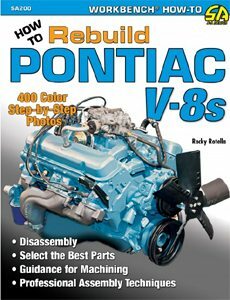 Most quality Pontiac engine builders and restoration parts suppliers offeradapter kits if one is required. The oil pan is on the same plane as the crankshaft, and it contains a large sump at the rear. Oil drawn from the sump is pressurized by the oil pump and filtered before being dispersed throughout the engine. Oil travels across the rear of the block to a galley that runs adjacent to the crankshaft on the left side. It feeds the camshaft, crankshaft, and left-side lifter bores as it travels toward the front of the block. It then crosses to the right side, feeding those lifter bores. A relatively large filter is used to keep the oil as clean as possible. It mounts to a cast-aluminum adapter that’s bolted to the right side of the block toward the rear. Depending upon the model year and application, a small variety of oil filter adapters were used throughout the course of V-8 production. It’s best to use the filter and adapter that was originally installed on your engine, unless a suitable replacement is available. The Pontiac V-8 oil pump is a rotary gear-type that’s driven by the distributor shaft. Pressure is regulated by a spring-loaded check valve, and the pickup contains a mesh screen that filters out debris that could damage the gears or keep the check valve from properly seating. Pontiac generally used oil pumps capable of generating a maximum pressure of 40 or 60 pounds per square inch (psi), depending upon the application. The SD-455 used a specific 80-psi unit. The stock Pontiac crankshaft is a durable and well-balanced unit. It features large counterweights and relatively large 2.25-inch-diameter connecting-rod journals. As stroke was added to increase displacement, main bearing diameter was increased to maintain sufficient crank pin overlap for adequate strength. Crankshafts produced through 1958 were steel forgings, while castings were used exclusively in later years. Because of main journal diameter differences, the early production forged-steel units do not directly interchange with later units without significant modification. The heattreated steel forgings used in specific high-performance applications during the late 1950s and early 1960s are some of the strongest crankshafts Pontiac ever produced and fit later blocks, but are quite rare. The first production cast crankshafts, which appeared in the late 1950s, were constructed of a material referred to in Pontiac literature as ArmaSteel. ArmaSteel is a GM trade name for its Pearlitic Malleable Iron (PMI) alloy, which possesses some strength qualities similar to certain steels. The crankshafts were constructed of cast-nodular iron in later years. ArmaSteel cranks can be identified by the ArmaSteel name cast in them, while a large “N” was often used to signify nodular-iron composition in later years. A crankshaft of either type is quite durable and completely adequate for regular production engines and even high-performance applications. Pontiac placed displacement callouts on each side of the block in 1968, and cast the last two digits of the displacement size into the center of the lifter valley. The “00” found on this block indicates that it’s a 400. Other examples include “50” or “55,” which indicate a 350 or 455, respectively. These features allow quick and easy determination of displacement. In most instances, the cast crankshafts directly interchange if the main bearing diameter is the same. Depending upon the original application, there are slight differences in the length of the front snout, diameter of the rear flywheel register, and counterweight shapes. So, if at all possible, comparing a potential replacement to the original is highly suggested. 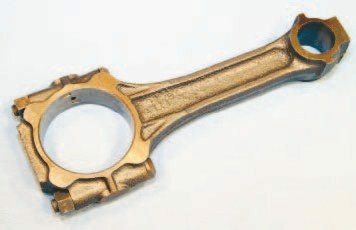 A connecting rod is one of most highly stressed components within an engine. The inertial force placed upon it during normal operation requires that it be constructed of a sturdy material that’s elastic enough to not fatigue during normal operation. Steel forgings are tough but the process is somewhat expensive. The rod must be properly heat treated to be able to withstand the additional force associated with greater power amounts or high engine speeds, which makes it even more costly. Cast connecting rods are much cheaper to produce. Cast iron is generally very strong up to its elastic point, but tends to shatter once surpassed. Pontiac constructed its cast rods of ArmaSteel, a specific iron desirable for its steel-like strength qualities. 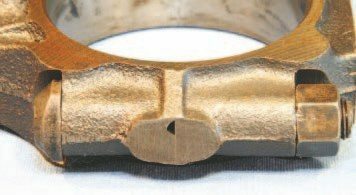 If an engine is operated within its intended limit, a properly designed cast connecting rod should provide a long service life in a given application, which makes it ideal for typical production engines. Pontiac’s basic I-beam connecting rod was introduced in 1955. The block’s tall deck height allows the use of a relatively long connecting rod with a center-to-center length of 6.625 inches, which produces a good rod-to-stroke ratio. This tends to lessen the amount of side loading placed on the cylinder wall, reducing cylinder wear and overall operational friction. Pontiac introduced its common cast connecting rod in 1963 for 389 applications. The Arma Steel unit was then used in all production engines from 1967 through 1979. It’s an excellent piece that is quite reliable when operated within its intended limit. Adding modern fasteners and proper preparation is an easy way to increase its durability during any rebuild. Though a low-grade steel forging, Pontiac’s 1955 connecting rod is completely adequate for its intended application of stock street performance, but the lack of heat-treating limits its strength for high-performance applications. A floating-piston wrist pin, which consists of a slip-fit wrist pin retained in the piston by snap rings on either end, was used through 1957. 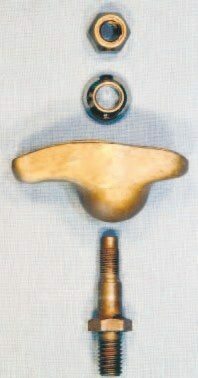 The pin was pressed into a fixed position beginning in 1958. Forged-steel connecting rods were used in all applications through 1962 and in select 421 applications through 1966. The 1973–1974 Super Duty 455 received a beautiful forged-steel connecting rod, which was a direct replacement for the cast unit. When hobbyists learned of its availability, orders poured into dealership parts departments. By mid 1974, more than 1,350 orders for complete sets were on backorder, yet Pontiac assembled fewer than 1,300 complete orders! A bulletin was issued stating that a valid VIN was required when placing any order and only four were supplied if the claim was accepted. Modern forgings have lessened their desirability today, but they remain fairly valuable. The Super Duty engines of the era used a moderate-grade steel forging that was heat treated to various standards, producing a noticeably stronger piece. These are quite rare today. 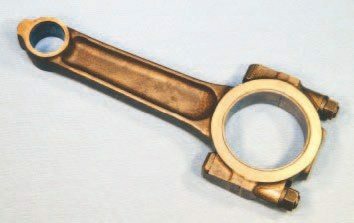 The most common Pontiac connecting rod that hobbyists are familiar with is the cast unit introduced in 1963 for 389 applications. It was used in all production Pontiac V-8s from 1967 through 1979, except for the SD-455. Pontiac developed a beautiful forged-steel connecting rod for the 1973 Super Duty 455. Retaining the stock 6.625-inch length, the quality steel forging was heat treated and blasted with metal shot to improve strength while being magnetic particle inspected for minute cracks several times during the manufacturing process. The SD-455 rod is an excellent piece that was the best available option for several years, and the price reflected it. The cast connecting rod includes a machined groove that serves to direct a jet of lubrication toward the camshaft and cylinder wall. Most likely because of emissions concerns, it was eliminated in September 1972. Factory literature states that the two rod types can be freely interchanged. Your rebuild can include either, but modern bearings do not include the required feedhole, which renders the feature useless. Though Super Duty connecting rods remain quite valuable today, the common forged-steel units from the 1950s and 1960s are far less desirable. Typically selling at a reasonable price, some hobbyists have improved rigidity by having them heat treated. The cost of that process along with the cost of adding modern fasteners and having them correctly sized can make them an unreasonable choice. Reusing your Pontiac’s original cast rods during your rebuild is certainly possible. A simple upgrade is the addition of modern fasteners, which tends to improve clamping force. However, the units are generally well over 35 years old and have endured countless miles and thousands of heating and cooling cycles during normal operation. There’s also no telling how close they’ve been pushed toward their elastic limit in the past. If there’s even a remote chance of a questionable past, consider upgrading to a modern forging. It’s cheap insurance. Pontiac developed its own castaluminum pistons, which were cam ground for precise fit. Cast pistons were used in essentially all production Pontiac V-8s, except for some of the unique maximum-performance engines. These engines, such as the Super Duties and R/A-IV, received forged-aluminum units. The factory cast piston is an excellent design. Its wrist pin is offset slightly toward the thrust side of the piston, which is intended to lessen thrust load on the cylinder wall and provide quiet operation. Depending upon the application, a valve relief was specifically positioned to provide maximum piston-to-valve clearance in most engines. 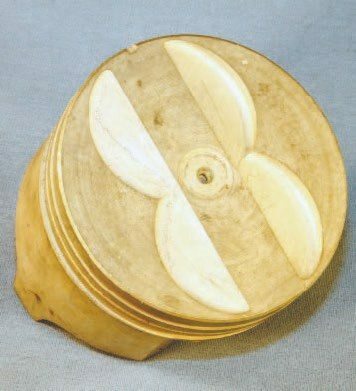 A dish was machined into the crown to reduce compression in a limited number of others, such as the 428. Mickey Thompson supplied Pontiac with forged-aluminum pistons for early Super Duty engines while TRW Automotive provided forgings for the R/A-IV and SD-455. The TRW pieces were precisely machined and quite reliable. TRW began offering a wide array of stockreplacement forged-aluminum pistons for Pontiac applications based on the R/A-IV design, and several of the high-volume offerings are presently available under FederalMogul’s Sealed Power line. Most Pontiac engines were assembled with cast-aluminum pistons similar to this. Some applications have the valve relief in a different position while others feature a dish in the center or a noticeable lip around the edge to reduce compression. It was an excellent design that was relatively strong and was made to run with tight piston-to-wall clearance. The piston pin is offset approximately 1/16 inch toward the thrust side, to reduce side load and ensure quiet operation. A harmonic balancer is located on the front snout of a crankshaft. 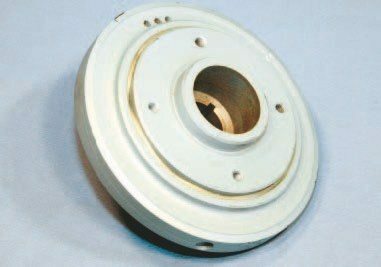 It generally consists of a center hub and floating outer ring isolated by rubber. It’s designed to dampen the irregular torsional vibrations that occur during combustion. It also contains a top dead center (TDC) timing mark for conveniently setting spark timing and is flanged to accept a pulley that drives the engine accessories. For many other makes it was slightly imbalanced and can be adjusted to balance the reciprocating assembly, but it was neutral balanced in nearly all Pontiac applications. Early Pontiac units bolted together and were somewhat complex. The design grew simpler over the years and eventually evolved into the unit that most hobbyists are familiar with today. Introduced in 1968, the common Pontiac harmonic balancer measures 6.75 inches in diameter and was used on select applications through 1979. It was quite reliable and rarely failed when installed properly. New old stock (NOS) units were still available from GM dealers until just a few years ago, so examples shouldn’t be very difficult to locate. 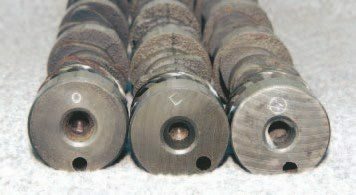 If a used balancer in good condition isn’t readily available, there are several companies that can rebuild them for you. 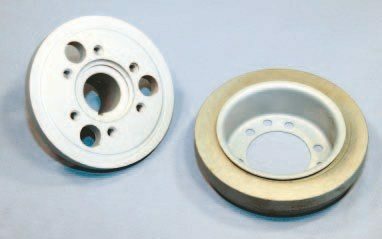 The same initiative aimed at reducing overall vehicle weight that resulted in material being removed from the block led to the introduction of a modified harmonic balancer. Pontiac knew that most of its mid-1970s engines wouldn’t rev quickly and that the internals wouldn’t be exposed to heavy inertial drag, so engineers determined that a traditional harmonic balancer wasn’t required for most production engines. The Pontiac harmonic balancer generally bolted together through 1967, and this two-piece unit was introduced in 1964. The inertia ring is pressed onto the stamped steel housing, which then gets bolted to the crankshaft hub. 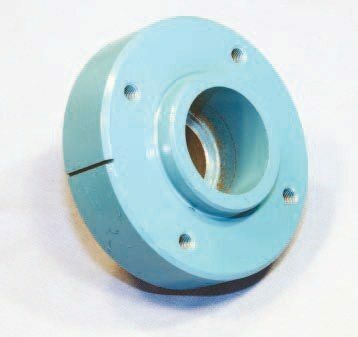 The accessory drive pulley is sandwiched between them. The most common Pontiac harmonic balancer was introduced in 1968 and measures 6.75 inches across. An excellent design that operates reliably when properly installed, it was used in all applications through mid 1976 and then in select applications through 1979. Your machinist can verify its accuracy during your rebuild. It should be replaced if it shows any signs of inaccuracy or pending failure. New units were available through GM parts departments until just a few years ago, so NOS units are still available. Aftermarket units are also available from your favorite Pontiac vendor. In mid 1976, Pontiac replaced the harmonic balancer on select applications with a crankshaft hub that offered no dampening ability whatsoever. It simply used drive engine accessories and contains a TDC timing mark. Engines unaffected by the running change include the long-stroke 455, any Pontiac engine backed by a manual transmission, and the T/A 6.6. These exceptions received a traditional balancer to ensure operational longevity. It’s highly recommended that a conventional harmonic balancer be used during any rebuild. This crankshaft hub appeared in mid 1976 on most 350- and 400- inch engines backed by an automatic transmission, including the 400 used in the Trans Am. It offers no dampening quality whatsoever. Its primary purpose is driving engine accessories and providing a top dead center mark for setting spark timing. It should be replaced with a traditional harmonic balancer during any rebuild. When Pontiac developed its V-8 package during the 1950s, the lifter bores were designed to deliver a sufficient amount of pressurized oil for hydraulic lifter operation. Save for a few Super Duty applications, which used mechanical camshafts for maximum-performance, Pontiac specified hydraulic camshafts in every production engine to produce a valvetrain that operated reliably and quietly and required very little maintenance. A typical hydraulic lifter in an overhead-valve engine is quite complex, but the functional design is a technological marvel. A hydraulic lifter is comprised of a main body and an internal plunger-and-valve assembly that relies on pressurized engine oil to continually adjust valve lash, so all the valvetrain components are constantly in contact with one another. The Pontiac V-8 block was designed to supply the lifter bores with additional oil flow to accommodate hydraulic valve lifters. All regular production Pontiac engines received flat-tappet camshafts and used similar hydraulic lifters. The hydraulic action allows the lifter to continually adjust to keep all valvetrain components in constant contact for quiet and consistent operation. This lifter has been completely disassembled to show the complex inner workings. The ballstud– type rocker arm system is a very simple design that contains relatively few moving parts. The rocker stud contains a tapered shoulder that’s used to position the rocker arm for proper valvetrain geometry. It was pressed into place in early years, and was screwed into place in performance applications from 1967 through 1973. A running change was made in mid 1973 that eliminated pressed rocker studs entirely. While on the base circle of the camshaft lobe, pressurized oil enters a feed hole and fills a cavity in the lifter body that’s located beneath the plunger. As the lifter body follows the cam lobe and begins rising, valvespring pressure transmitted through the pushrod compresses the plunger against its spring-loaded check-ball, immediately isolating the lifter from the engine oil supply. As the cam lobe travels toward peak lift, the lifter and plunger rise as a unit, lifting the pushrod, which in turn lifts the valve off its seat. Resistance from the valvespring pressurizes the oil within the lifter body, which causes a small amount to bleed outward between it and the plunger. It is generally referred to as “leakage.” Once the lifter travels up and over the entire cam lobe and is back on the base circle, internal spring pressure causes the lifter to expand and force the plunger upward, which eliminates valve lash, opens the check-valve, and allows pressurized oil to refill the lifter-body cavity before the next lift cycle starts. Leakage rate is controlled by using various degrees of lifter-bodyto-plunger clearance. Pontiac used specific-rate hydraulic lifters for certain applications over the years. In nearly all its production engines, plunger depth was preset by using a tapered rocker arm stud and a corresponding adjuster nut. The combination ensured that the lifter functioned correctly by continually adjusting in any condition and with normal valvetrain wear. The R/A-IV may be the most well-known production engine to use special hydraulic lifters that required manual lash adjustments. As hydraulic lifter leakage occurs during normal operation, a small amount of pressurized oil is sent through a hollow pushrod to lubricate the contact end of the stamped steel rocker arm. Through the early 1960s the rocker arm pivot was lubricated by pressurized oil that was fed to the cylinder head rocker studs from the camshaft journals. In later years the system was revised and the pushrod supplied all lubrication exclusively. Many Pontiacs were originally assembled with a timing set that used a cam gear with nylon teeth. Intended to provide quiet operation and less operational load, it was prone to failure because the unit aged and the nylon teeth grew brittle. Any that broke off almost always ended up in the oil pan sump, where it posed no threat. 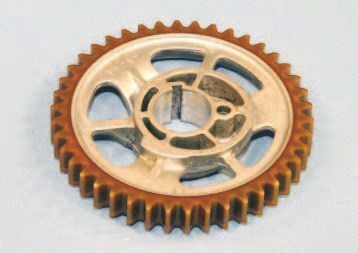 A steel cam gear is always recommended for any rebuild. The stamped-steel rocker arms were somewhat adjustable in 1955 and in a fixed position in most 1956- and-later regular production engines. The R/A-IV required manual lashing, however. All engines received pressed rocker arm studs through 1967, and threaded rocker studs were used in performance applications beginning that year. A pushrod diameter of 5/16 inch was used in most production engines, while the R/A-II and R/A-IV used 11/32-inch-diameter units for additional stability. Pontiac Engineering took camshaft design very seriously. During the late 1950s and early 1960s, the production camshafts were so technologically advanced that the factory-installed units performed as well as many of the aftermarket camshafts available at that time. Pontiac attained maximum performance for its production vehicles by adding several degrees of exhaust duration to compensate for the somewhat flow-deficient exhaust port and complete exhaust system. Also the intake lobe center was delayed to make engine performance livable on questionable-quality fuel. Mac McKellar was one of Pontiac’s top camshaft designers, and he once said that gross valve lift was limited to just over .400 inch in most instances because the cylinder heads generally contained larger valves and that the small ports promoted good velocity. High valve lift simply wasn’t needed to achieve good performance from most of Pontiac’s passenger car engines. That moderate valve lift provided customers with a durable valvetrain while maximizing service life. 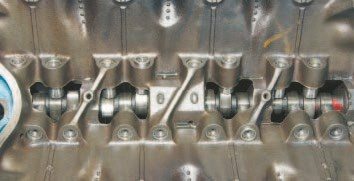 Pontiac found it easier to increase rocker arm ratio than to modify the actual camshaft lobe if additional lift was required for a particular application. McKellar reasoned that adjusting rocker arm ratio is less stressful on the valvetrain while increasing all aspects under the lift curve, and it can make the camshaft appear slightly larger to the engine at the same time. Pontiac generally used 1.5:1 rocker arms, but 1.65:1 rockers were specified in certain high-performance applications, such as the SD-421 and R/A IV. Many of Pontiac’s most popular camshafts were developed during the mid-to-late 1960s. The 066 and 067 were considered the workhorses, offering the best combination of street manners and performance. The 068 and 744 were specified for high-performance street applications. The high-lift 041 was introduced in 1968-1/2 for the R/A-II and was combined with 1.65:1 rockers to produce nearly .520-inch lift for the R/A-IV in 1969 and 1970. The camshaft identifier stamp was sometimes a shape instead of an alphanumeric character during the late 1970s. These three camshafts are 1977–1979 T/A 6.6 units. The valve events of each vary slightly. They are, from left to right: 1977 T/A 6.6 automatic transmission, 1977 T/A 6.6 manual transmission, and all 1978–1979 T/A 6.6. Pontiac used 1.5:1 stamped steel rocker arms in nearly all its V-8 applications. 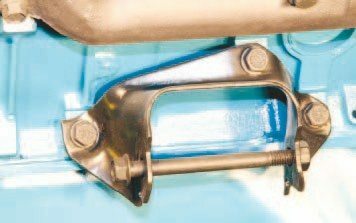 A 1.65:1 rocker arm was developed to increase gross valve lift of early Super Duty and R/A-IV engines by 10 percent over its 1.5:1 counterpart. Moving the pushrod cup toward the rocker stud increases the ratio. The difference is virtually undetectable unless the original units are compared side by side. 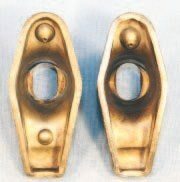 A 1.5:1 stamped steel rocker arm is on the left while a 1.65:1 unit is on the right. Both are original Pontiac units. Various camshafts were compared during the performance era to find the grind that best complemented a particular engine’s operating characteristics for a given application. A manual-transmission engine generally received a camshaft that was slightly more aggressive than its automatic-backed counterpart because it could generally tolerate a little more duration, and buyers opting for a manual transmission were generally performance minded.Once emissions regulations became a greater concern, camshafts were mostly chosen based on emissions compliance. Pontiac’s basic overhead-valve cylinder head with D-shaped exhaust ports was introduced in 1955. The same general intake and exhaust port configurations were utilized on most production engines through the end of V-8 production in 1981. In all instances the cylinder heads were retained to the block by a total of 10 1/2-inch-diameter bolts, which allows any Pontiac cylinder head to be installed onto any Pontiac block. Pontiac’s D-port head was introduced in 1955, and airflow was generally increased over the years by enlarging valve diameters. The 2.11-inch intake and 1.77-inch exhaust made their debuts in 1967 for performance applications. A number of castings were used in the following years. Exhaust valve size decreased to 1.66 inches in 1973, but airflow wasn’t affected much. 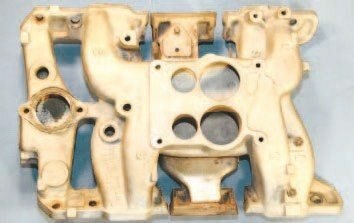 Smog-era castings, such as this 6X, can be purchased quite reasonably and make excellent performance cylinder heads in stock form. 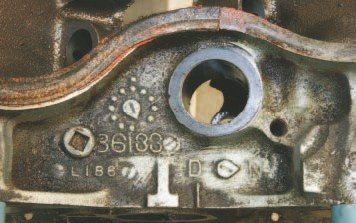 Casting numbers, generally located on the center exhaust port, identify Pontiac’s D-port cylinder heads. It typically consists of two or three digits, but is sometimes a complete part number located on the valve cover rail. This particular 6X casting was used from mid 1975 to 1978. A quick search on the Web helps determine the original application of most Pontiac castings you might come across. The small intake and exhaust ports were designed to maximize port velocity, which is critical when attempting to maintain good throttle response and low-speed street manners. The combustion chambers were fully machined for several reasons, among which was to maintain good chamber volume consistency and reduce the risk of detonation. As the engines grew larger and were designed to operate at higher engine speeds, the intake and exhaust valves were enlarged and the ports were reshaped to increase airflow. During the late 1950s and again in the 1960s, Pontiac revised the method in which the intake manifold bolts to the cylinder heads. The original reverse-flow design was replaced by the conventional-path system. The oiling system was also slightly revised. A pushrod-oiled system replaced the stud-oiled rocker arm. Most of these changes can be overcome relatively easily if you’re attempting to use a block and cylinder heads from different years. The cylinder head design used from 1965 through the end of traditional V-8 production in 1979 allows for directly interchanging any casting. Castings of this era are generally easiest to find and work with any block configuration. 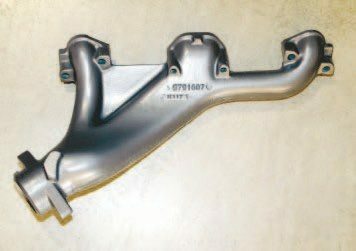 There’s a wide variety of options if you need to replace your Pontiac’s existing castings. You simply need to educate yourself on the major casting differences and how they could affect the outcome of your project. 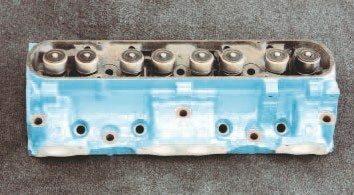 All Pontiac cylinder heads produced in 1965 and 1966 feature 1.92/1.66-inch valves and pressed rocker studs. Mild port work can increase intake airflow beyond the stock range of roughly 190 cfm at 28 inches of pressure, and larger valves can be installed. Unless limited to such castings for originality purposes, cylinder heads from 1967 or later may be a better option. In addition to the displacement increase for 1967, Pontiac improved piston-to-valve angle and increased valve diameters to 2.11/1.77 inches in performance applications. This improved peak airflow by about 20 cfm to an approximate total of 210 at 28 inches of pressure, while intake port volume remained around 153 cc. Mild street applications through the mid 1970s continued using small intake valves (1.96-inch) and 1.66- inch exhaust valves were common from 1973 forward. A running change eliminated the pressed rocker studs entirely in 1973. Threaded rocker arm studs became standard equipment in all applications in May of the model year. Pontiac began using only 2.11- inch intake valves for its 350, 400, and 455 engines, regardless of application. Because of these common characteristics, virtually any mid-tolate 1970s D-port casting is suitable for any performance rebuild, and they can usually be purchased quite reasonably. Beginning in 1973, a secondary application stamp appeared on cylinders heads, and it denoted such variables as original application, valve sizes, and combustion chamber volume. The stamp is located on the vertical accessory boss located between the left and center exhaust ports. As with this casting, the stamp is sometimes off center and can be difficult to read. 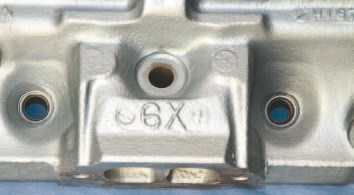 The “8” shown on this 6X casting indicates that it was originally intended for a 400 engine and features 100-cc chambers. All D-port cylinder heads with 2.11- inch intake valves feature an intake port volume of approximately 153 cc. Peak airflow is somewhere around 210 cfm at 28 inches of pressure regardless of casting number. Common small-valve castings with 1.92- to 1.96-inch intake valves generally peak around 190 cfm in similar conditions. Testing shows maximum airflow occurs around .450-inch valve lift in either instance. Pontiac developed a series of cylinder heads for high-performance applications that featured round exhaust port outlets and boasted of improved airflow. 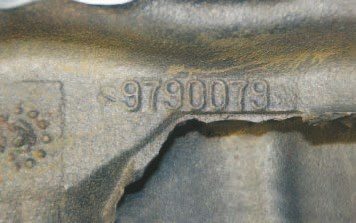 Introduced in 1968 and used through 1974 in various forms, casting numbers found on the center or end exhaust ports generally identifies the “round-port” heads. They were originally installed on some of the rarest and most desirable Pontiacs ever produced and remain very valuable. 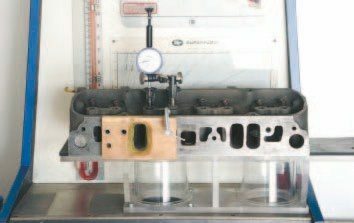 While most D-port cylinder heads with large intake valves make an excellent choice for any highperformance street application, Pontiac produced a series of castings in the late 1960s and early 1970s that aimed to take the top-performance engines to the next level. 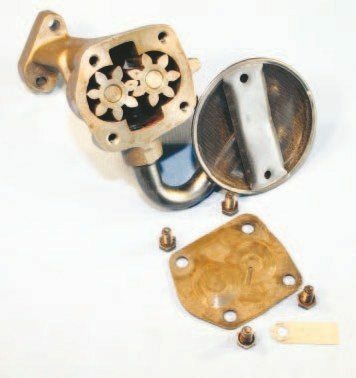 Featuring unique round exhaust outlets, these “round-port” castings possess welldesigned intake and exhaust ports and their excellent airflow characteristics can extend an engine’s maximum operating speed by several hundred RPM. 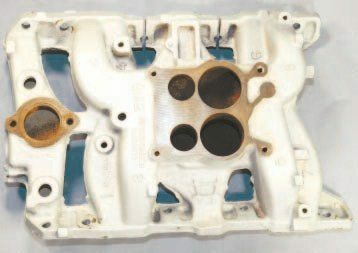 The 1968-1/2 R/A II castings share the same basic intake port as the number-670 D-port cylinder head from 1967, which measures roughly 153 cc and flows roughly 210 cfm. The intake port was enlarged by nearly 30 cc for the 1969 R/A-IV, and as a result, peak airflow increased to about 240 cfm at 28 inches of pressure. Combustion chamber volume of approximately 72 cc allows the engine to achieve its intended compression ratio of just greater than 10:1 on the 400. That feature makes these castings all but unusable for larger engines operating on modern pump fuel. The round-port casting was revised slightly for the 1971 and 1972 455 H.O. The combustion chamber was enlarged to more than 110 cc to reduce compression ratio to 8.4:1 and the intake port floor was raised to accommodate the large chamber, which took about 10 cc of intake port volume with it. This change reduced peak intake airflow to roughly 230 cfm at 28 inches of pressure. The SD-455 cylinder head was redesigned. Its intake and exhaust ports are aimed at maximizing port efficiency and peak airflow increased to just over 240 cfm in similar test conditions. 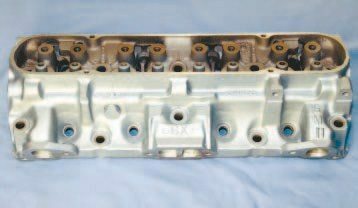 In general, the cost for a pair of usable D-port cylinder heads can range from less than $100 to several hundred, depending upon the casting. Beyond combustion chamber volume and its effect on resultant compression ratio, however, there’s very little functional difference among them. Even small-valve castings, once considered worthless, can be retrofitted with larger valves, making them functionally equivalent to an original 2.11-inch casting. The round-ports generally start at more than $1,000, however, and can approach several thousand, depending upon the casting application. The intake manifold is generally one of the first items replaced when modifying an otherwise stock engine for improved performance. Often, factory manifolds are at best a design compromise, with more focus on lowspeed efficiency and emissionsfriendly economy than high-RPM performance. Aftermarket units tend to produce greater amounts of peak power but don’t always provide optimal street manners. However that’s not necessarily the case with Pontiacs. The Pontiac intake manifold features a divided plenum, which creates a “dual-plane,” or a 180-degree, design. Four runners draft from one half of the carburetor while the other four runners draft from the opposite side of the carburetor. Half the cylinders see only one half of the carburetor. This design typically accentuates low-speed street manners and favors torque production, and it perfectly complements the intended operating range of the 1955 Pontiac V-8. 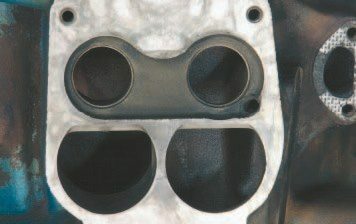 The basic 2-barrel intake manifold designed in 1955 was used through 1974, and with minor modifications over the years. 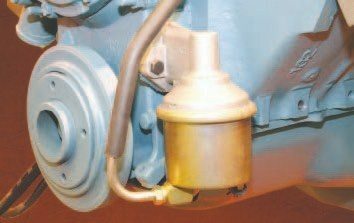 The basic 4-barrel design was introduced in mid 1955 and was used through 1966 on all 4-barrel engines, and in select 1967 applications. A dual 4-barrel intake manifold was used in certain maximum-performance applications in the 1950s and early 1960s. When Tri-Power was introduced in 1957, it was intended to offer additional performance over the 4-barrel, and was available on all high-performance street engines through 1966. GM banned the use of multiple carburetion on all 1967 vehicles, except the Corvette. Pontiac developed a beautiful cast-aluminum single 4-barrel intake manifold for the early-1960s Super Duty, and it featured long, smoothly contoured runners. It proved to offer an excellent combination of low-speed torque and high-speed horsepower. A modified version of this intake manifold was used with the new Rochester Quadrajet to produce an induction package that performed as well as, and quite possibly better than, the Tri-Power it replaced in 1967. In 1955, Pontiac unveiled its V-8 with a 2-barrel intake manifold. The basic intake casting continued through 1974 with minor modifications. Runner dimensions are generally smaller than the 4-barrel unit. Therefore, it is intended to promote maximum velocity (increasing low-speed performance), but it limits top-end power. While a 2-barrel setup is certainly capable of providing plenty of performance, a 4-barrel should be considered for any performance rebuild. Tri-Power was introduced in 1957 to provide Pontiac’s top performance street engines with a performance boost over the 4-barrel carburetor. The trio of Rochester 2-barrel carburetors became a Pontiac trademark. 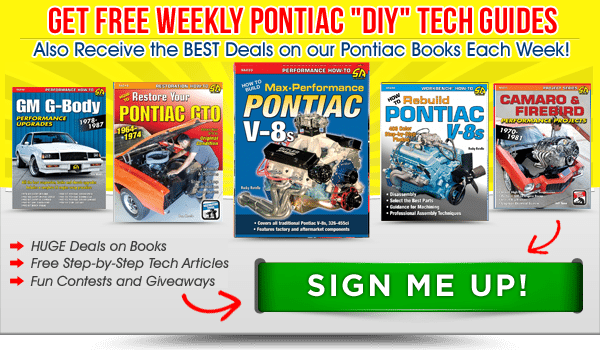 It was a wise marketing move that truly gave Pontiac a more youthful appeal with America’s hot rodders and generated a high volume of customer traffic at dealerships. The popular cast-iron 4-barrel intake manifold was introduced in 1967, and it was used in performance applications that year. It was used in all 4-barrel applications beginning in 1968. It saw minor changes to such areas as bracket mount points and exhaust crossover dimensions over the years. It’s arguably the best performance intake manifold available for any street-driven Pontiac that’s shifted below about 5,500 rpm. 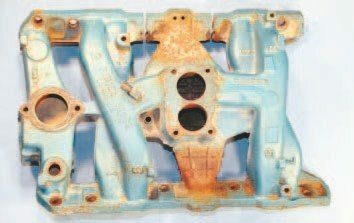 The cast-iron 4-barrel intake manifold used from 1968 forward is among the best performing units available for a street-driven Pontiac. Independent flow testing reveals that even with the addition of exhaust gas recirculation (EGR) in 1973, and the unsightly appearance of a unique carburetor flange in 1975, its airflow characteristics and performance potential weren’t grossly affected. The basic casting received several minor changes over the years, which can affect direct interchange. This includes exhaust crossover port size, and various methods of mounting the automatic choke, throttle linkage, and rear bracket for the air conditioning compressor. 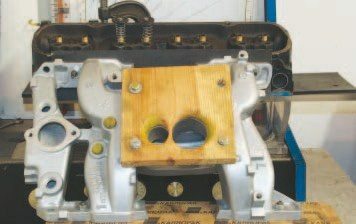 These are small obstacles that can create difficulty when combining an intake manifold of a certain vintage with a vehicle of another, but they are relatively easy to overcome. The carburetor flange of the 4-barrel intake manifold was significantly modified in 1975 to accommodate the rerouted EGR system. It required a “dish” directly under the carburetor primaries, which gave the secondary openings a pronounced “D” shape. From looks alone, this manifold should significantly restrict airflow, but independent testing reveals otherwise. It is completely adequate for a strong-performing street engine. The most desirable factory units are the cast-aluminum versions used on 1969 to 1972 R/A-IV and 455 H.O. engines and the cast-iron 1973–1974 Super Duty 455 manifold. They feature enlarged runners to complement the increased airflow capacity that the larger cylinder head intake ports offer. These manifolds are quite valuable and while capable of sustaining greater amounts of peak horsepower, the performance effects are negligible on a street-driven Pontiac. A carburetor’s role is to provide an engine with precise amounts of fuel and air at a particular RPM or engine load. A throttle valve controls the volume of air passing through the bores and past the fuel discharge nozzles, which draw atomized fuel from the float bowl and through the nozzles. The goal is to produce peak performance in all driving conditions from light part-throttle to wide open. 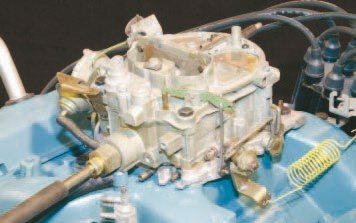 When developing a carburetor for a specific application, carburetor engineers use a mathematical equation to determine the amount of air a particular engine must ingest to effectively operate at its intended RPM peak. It may seem easiest to simply increase carburetor size when the required airflow capacity is greater than the carburetor can supply. But doing so has consequences. A larger carburetor bore can lessen air velocity, subsequently reducing nozzle signal, and ultimately degrading throttle response and low-speed performance. High-flow R/A-IV and 455 H.O. cylinder heads feature intake ports that are taller than those of a conventional D-port casting. A specific intake manifold was developed for those applications. With an appearance identical to the standard manifold, its runners were enlarged internally to support additional airflow. Instead of using cast iron, however, the high-flow units were aluminum and contained a separate cast-iron heat crossover. Flow testing an intake manifold can predict the effect it may have on total performance. The task is somewhat tedious and requires using a cylinder head and measuring each runner separately, but the results allow hobbyists to accurately determine the flow differences among various castings. Testing proves that there’s very little flow variance from any 1968–1979 cast-iron 4-barrel intake manifold. Pontiac V-8 was introduced with a Carter 2-barrel carburetor. A Carter 4-barrel was made available in mid 1955 for customers seeking to improve performance. The 2- and 4-barrel options remained for 1956. A unique Rochester dual-4-barrel setup was created for hobbyists looking for a complete maximum-performance package intended for various forms of competitive racing. Part of Pontiac’s goal during the 1950s was to change its image and produce equipment that was favorable with young performance enthusiasts. Many aftermarket manufacturers were offering a singleintake manifold that allowed the use of a trio of 2-barrels for various makes. Pontiac was among the many manufacturers that offered and marketed such an option for its performance vehicles beginning in 1957. Heralded as “Tri-Power,” it was Pontiac’s top regular-production performance option through 1966. The Rochester 2-barrel was a simple design that worked quite well. It remained the carburetor of choice from 1957 through 1974 in all 2-barrel and Tri-Power applications except for a lone 1972 350-ci manual-transmission engine, which specified a Carter 2-barrel. Finding used units isn’t too difficult today, but finding specific castings for certain engines can be time consuming and costly. Two competent companies that presently support the Rochester 2-barrel are The Carburetor Shop and Cliff’s High Performance. During the early days of 4-barrel production, Rochester carburetors received a bad reputation when compared to Carter. Rochester was perceived as a carburetor company that simply produced carburetors to auto manufacturer specifications for production vehicles. Carter went a step beyond, however, and offered a limited line of tuning parts available on the aftermarket. When placed in service, the Rochester Model 4GC and Carter WCFB 4-barrel carburetors performed much the same. Beginning in 1957, Pontiac started using the Carter AFB for its performance applications and it remained a regular-production carburetor through 1967. 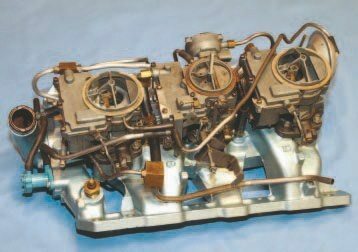 The Carter AFB was an excellent performance carburetor when tuned properly, and it was able to rival the performance of the Tri-Power in certain Pontiac applications. The TriPower was quite profitable for Pontiac, and it was a key feature with enthusiasts. To maintain its performance advantage over the 4-barrel, Pontiac specified that a “wing” be added inside certain AFB castings, which limited airflow and subsequently affected full-throttle performance. Rochester engineers discovered that throttle response and fuel economy could be improved by decreasing primary size while the engine’s maximum flow requirement could be fulfilled to maintain strong fullthrottle performance by incorporating in a larger secondary size. Named “Quadrajet,” the design was a highly efficient, well-balanced unit that was practical for virtually any driving condition. The Model 4M Quadrajet first appeared on select 1965 Chevrolet applications, and by 1968 it was the only 4-barrel used by the GM divisions, except for those specialized Chevrolet applications that used a Holley. The primary bores supplied each engine with a fixed amount of airflow while the secondary circuit featured a vacuum-operated air valve, which was factory preset, supplied just enough total airflow to fulfill a particular engine’s requirements. The mechanical fuel pump was mounted on the front of the engine, where it received airflow wash from the cooling fan. Canister units like this begun appearing on production vehicles during the 1960s. AC Delco was the original supplier in most instances, and direct replacements are still available for many popular applications. The Carter AFB was a popular 4-barrel carburetor during the late 1950s and 1960s. Pontiac used it in most 4-barrel applications from 1958 through 1966. Carter even offered tuning parts to improve performance beyond the factory setting. But finding replacement and performance parts can now be difficult. Pontiac began using the Quadrajet in 1966 on its six-cylinder Sprint engines, and for its performance V-8s in 1967. But the Carter AFB 4-barrel remained the specified unit for certain 1967 applications. The Quadrajet was used exclusively in 1968 on all 4-barrel Pontiac applications and though the casting saw minor changes over the years, the Model 4M remained Pontiac’s only 4-barrel through 1974. The Model 4M that Pontiac used contains a primary diameter of 13 ⁄32 inches, and they’re generally referred to by their assumed airflow rating of 750 cfm. Independent airflow testing reveals that this value is actually pretty close. With the secondary air valve adjusted to the maximum flow position, these castings are capable of flowing as much as 775 cfm. Rochester took a couple of different approaches toward increasing the airflow capacity of its Model 4M during the early 1970s. Pontiac worked closely with Rochester to develop a unique casting that lacks the outer ring of the booster cluster in the primary bore for specific 1971 applications. The 1973–1974 Super Duty 455 uses a Quadrajet with a revised main body, which includes a primary diameter increase of 1/4 inch to a new total of 17 ⁄32 inches. The latter unit is often referred to as an 800-cfm casting, and independent airflow testing shows that its total capacity is just a bit more than 810 cfm. A modified version of the 4M, designated Model M4M, was introduced for the 1975 model year. Not only did the redesigned unit contain several internal enhancements to improve engine efficiency, the main body of every Pontiac V-8 (from 301 to 455, depending upon the model year) featured the 17 ⁄32- inch-diameter primary, like the Super Duty’s Model 4M casting. 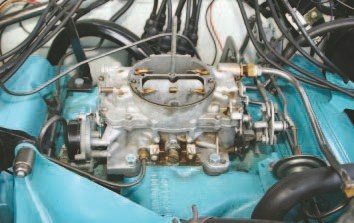 Scorned by many as smog-era carburetors with very lean fuel metering, the casting changed very little for the remainder of the 1970s, and it makes for an excellent performance unit once modified correctly. The Quadrajet saw some significant design changes during the 1980 model year as computer control command was introduced. Designated E4M, many of the mechanical internals were replaced by electronic components, offering more precise control over the fuel curve, reducing emissions, and improving long-term consistency. However, the E4M requires an electronic module for normal operation. An exhaust system is designed to carry hot engine exhaust away from a vehicle while muffling the pressure waves (sound) at the same time. The very best exhaust system is one that effectively reduces engine noise without reducing engine performance. Noise-level regulations, overall exhaust tone, space constraints, and cost are also major factors that manufacturers must consider when designing complete exhaust systems for production vehicles, and performance is sometimes compromised in order to meet those goals. The frame design of the 1955 Pontiac forced the use of a single exhaust system. Dual exhaust pipes were a popular upgrade with performance enthusiasts, however. In true hot rodder fashion, hobbyists devised several ways of adding a second pipe in search of a slight power increase. A factory-installed dual-exhaust package was made available when a modified frame was introduced in 1956, which boosted the factory horsepower rating by about 10. Dual exhaust was then used on every regular production performance Pontiac through 1974, at which point a single exhaust catalyst was introduced. The Rochester Quadrajet was introduced in 1967 as a Tri-Power replacement. It replaced the AFB in low-performance 1968 applications as well and became Pontiac’s only production 4-barrel carburetor. The design promotes maximum street manners while operating on the primary circuit, and strong fullthrottle performance when the large secondary barrels open. It saw minor modifications over the years and was used by Pontiac through the end of V-8 production 1981. Most regular-production Pontiac engines utilized log-style cast-iron exhaust manifolds. This design simply gathers the gas exiting the cylinder head in a central chamber, sends it through a common collector into 2- or 2.25-inch tubing, and then to a muffler. Many variations of this type were used over the years, and they are generally considered the most restrictive from a performance perspective. Pontiac realized early on that separating and merging certain exhaust manifold runners and increasing their length improved engine efficiency, which translated into better high-speed performance. The first long-branch manifold was introduced in 1958, and the first full-length cast header was introduced for the Super Duty package a year later. These units remain among the best performance exhaust manifolds ever produced by an auto manufacturer. Common log-type exhaust manifolds are intended to do little more than gather exhaust gas and route it toward the muffler. Pontiac produced a wide variety of examples over the years for different chassis applications. While not the best choice for a high-performance rebuild, they are sufficient for mild- to moderate-performance applications. Used examples are relatively inexpensive, but be sure any replacement fits your particular Pontiac. 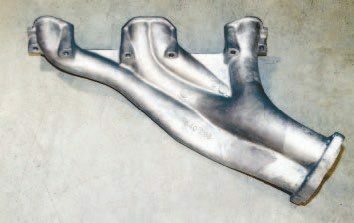 The long-branch exhaust manifold was revised slightly for 1967 to accommodate the new Firebird chassis. Still featuring individual exhaust runners, it was used in all high-performance Firebird applications and was available in both D-port and round-port configurations. A compact high-flow exhaust manifold was created for the 1967 Ram Air GTO. It was then used on various A-body applications through 1972, and certain Firebirds from 1970 to 1974. Retaining four separate runners and a single collector, the Ram Air unit contained shorter runners, which are internally separated. The lack of runner length affects performance slightly, when compared to the long-branch, but it remains a significant improvement over the standard log-type unit. Pontiac’s cast header was developed to maximize exhaust efficiency of the early Super Duty engines. It featured a bolt-on collector that could be uncapped to bypass the exhaust system. The most common unit was constructed of cast-iron, but a cast-aluminum version, like this reproduction from Ram Air Restoration Enterprises (RARE), was available for certain applications. The Super Duty castings offer tube-header-like performance. Pontiac used high-flow exhaust manifolds to improve the efficiency and usable power of its highperformance engines. Along with the other GM Divisions, Pontiac also used specifically designed mufflers to produce optimal vehicle performance while providing its “signature sound.” This was achieved by using unique internal designs for each vehicle and sometimes even on certain applications. Most Pontiac mufflers reduce sound pressure levels and eliminate undesirable droning through a combination of flow path management, frequency attenuation chambers, and pulse absorbing cavities. Original Pontiac mufflers generally flow 55 to 70 percent of a straight pipe while those destined for high-performance applications typically utilized larger diameter internal tubes, and may flow slightly more. Oldberg Manufacturing Company provided many of the mufflers used on various 1964 to 1973 Pontiac models. Pontiac’s mufflers typically featured circular, extruded holes instead of linear perforations, which produced the trademark Pontiac sound. Pontiac’s dual transverse mufflers maintained significant separation between the left and right sides of the exhaust flow after the two streams met in a blending chamber located in the center of the muffler. This gave the Firebird its unique sound. The “Ram Air” exhaust manifold was introduced in 1967 for the 400 H.O. and the tight confines of the A-body chassis. Featuring four runners that are separated internally, its use expanded to the Firebird line in 1970. Available in both D-port and round-port configurations, they generally perform as well as any “shorty”-style aftermarket header. 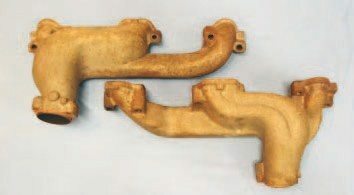 The “long-branch” exhaust manifold was an adaptation of the original Super Duty casting, which was developed to improve performance of certain first-generation Firebirds. Its use also included certain fullsize vehicles with high-performance engines. On average, the longbranch manifold has a 7- to 10-hp advantage over a comparable Ram Air type. Some mufflers, such as those used with the Super Duty 421 engine, were a straight-through design. Since these engines were limited-production units intended for sanctioned racing, maximum flow was more of a concern than sound quality or muffling ability. In some cases, multiple suppliers provided replacement mufflers stamped with the same GM part number. But they were not internally identical to the production units that were actually installed on the vehicle during assembly, subsequently affecting sound.